In the language of the Western just war tradition, the attacks of Sept. 11 were indiscriminatethey (at least, those on the World Trade Center) involved a direct and intentional attack against civilians. But Osama bin Laden appeals to the tradition of Islam; he holds that such attacks are not only permitted, but obligatory for committed Muslims. Is he right? Are the just war and jihad traditions so utterly distinct? Osama bin Laden, the son of a prominent Saudi contractor, first came onto the international scene when he left home and family to fight with the Afghan resistance during the 1980’s. Soviet aggression had called forth a storm of international protest. For Muslims, however, the invasion took on a special meaning. In Islamic law, the invasion of Islamic territory by a non-Muslim power becomes the occasion for a defensive war, in which all Muslims are to do their part to resist and repel the invasion. Coming as it did on the heels of a large-scale revival of Islamic piety during the 1970’s, and particularly of the Iranian Revolution of 1978-79, the invasion of Afghanistan offered a young and idealistic Muslim like bin Laden the chance to put his devotion into practice. In Afghanistan he could participate in the defense of Muslims and of Islamic values in a case where right and wrong were clearly distinguished. And so he did. Along with other volunteers from Saudi Arabia and the gulf states, bin Laden came to be known as an Arab Afghan, an honorific indicating his role as a mujahid, or struggler, in the service of Islam. It also provided him with the aura of a seasoned warrior. From Afghanistan, bin Laden moved on to other activities in the service of the Islamic community. Most pertinent for our interests is his response to Iraq’s invasion of Kuwait in August 1990. According to a number of reports, bin Laden offered to participate in orchestrating a defense for his Saudi homeland that would draw on the international network of fighters forged during the struggle in Afghanistan. When the defense of Saudi soil became the task of an international coalition led by the United States, bin Laden expressed strong opposition. Reliance on foreign powers, he argued, is no way to maintain one’s independence. The Saudi royal family portrays itself as the guardian of the holy places in Mecca and Medina. These two sites, where Muhammad received the Quran and built the early Islamic community, are the most important in the history of Islamic tradition. Indeed, from the standpoint of Islamic tradition, they are (along with Jerusalem) the most important sites in the history of humanity. From early on, the rule of Islam called for no non-Muslims as permanent residents in the Arabian peninsula, the land of the two holy places. Bin Laden’s objections to foreign troops defending Saudi soil suggested that the Saudi regime was compromising its legitimacy. And he was clearly worried that the United States and its allies, once present in the Arabian peninsula, would not leave. Following the Persian Gulf war, the Saudi government announced that foreign troops would be leaving soon. Those listening to U.S. policy makers were hearing a different story. The secretary of defense at the time, Richard Cheney, the chairman of the Joint Chiefs of Staff, Colin Powell, and others thought that U.S. interests would be well served by the establishment of a small continuing presence in the gulf. This would allow for special training for U.S. and allied troops and also for rapid deployment in the event of another crisis in the region. In the end, U.S. troops stayed, exacerbating the worst fears of bin Laden and others. The Saudi regime, interested in its own security, moved to limit internal dissent. Bin Laden went into exile in Afghanistan, then Sudan and, most recently, back to Afghanistan. Here bin Laden operates the training center and organization with which the U.S. and international community have been so concerned. Even before the attacks of Sept. 11, there was evidence to link bin Laden and his colleagues with attacks on U.S. embassies in Tanzania and Kenya, and with a number of other instances of violence. Thus bin Laden is a radical disaffected from the policies of his home government, particularly insofar as those policies involve cooperation with the United States. But he is also a man convinced of the truth of Islam and of the need to defend Islamic values. These values, he is convinced, are under siege. The United States, which he understands as a society motivated by greed, is engaged in a direct attack on Islam; the Saudi government and other Muslim governments are either corrupt or too weak to resist. Bin Laden believes these facts suggest that the Islamic community is in an emergency situation. The community and its values are under direct attack. Muslims around the world must rally in the defense of true religion and, indeed, in defense of the interests of all humanity. Given bin Laden’s appeals to Islam, he needs to portray his battle within the Islamic understanding of war. In Islam, as in Christianity and Judaism, there is a long history of discussion concerning the morally legitimate use of military force. 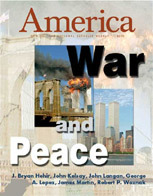 Anyone who reads bin Laden’sfatwaor opinions regarding the obligation of Muslims to strike at U.S. interestsand thus to force an American withdrawal from the Arabian peninsulawill see that he wishes to tie his judgments to precedents established by highly regarded figures in the history of the Islamic law of war. Bin Laden notes, for example, that he and others tried to affect Saudi policy by nonviolent means, suggesting that force is a last resort. He argues that the United States is not only engaged in an occupation of the Arabian peninsula, but is using the territory as a staging ground for air strikes against the Muslim population of Iraq. The United States is trying to distract Muslim and international attention from the actions of Israel in its designs to create a greater Israel inclusive of the West Bank, Gaza and significant portions of Egypt, Lebanon, Syria, Jordan and Saudi Arabia. Thus war is necessaryone could even say imposed upon the people of the regionas a condition of their survival. One can certainly question bin Laden’s interpretation of facts. Following the Persian Gulf war, allied policy established a number of no-fly zones as a means of limiting Saddam Hussein’s ability to act in southern and northern Iraq. Together with attempts to eliminate Iraq’s program to develop weapons of mass destruction, this was thought to be a responsible way to encourage stability in the region. And whatever one wants to say about Israel’s conflict with the Palestinians, the notion of a greater Israel requires scenarios that are highly unlikely. Still, in the interest of enforcing restrictions on the regime of Saddam Hussein, U.S. and allied forces have engaged in a persistent campaign involving the use of aerial bombardment and a variety of economic sanctions. The overall impact of such policies, whatever their justification, has been catastrophic on the lives of ordinary Iraqis. There are also reasons to question bin Laden’s interpretation of the Islamic law of war in hisfatwa. There is, for example, an important issue of how and when an ordinary Muslim (as opposed to a head of state, in consultation with recognized religious authorities) may declare that war is a duty for the Islamic community and its members. For the moment, however, let us focus on the provision in a 1998 opinion to the effect that The ruling to kill the Americans and their alliescivilians and militaryis an individual duty for every Muslim who can do it in any country in which it is possible to do it. This statement authorizes deadly force that is, in the terms of just war tradition, indiscriminate, in the sense that it makes civilians and military, noncombatants and combatants, legitimate targets for direct attack. As the tradition developed, Muslim scholars had occasion to confront a variety of questions raised by battlefield experience. They knew, for example, about collateral damage, about killings covered by the rule of double effect and other categories familiar from the just war tradition. Their treatments of these suggest that the best way to understand the prophetic sayings is as follows: No one fighting in an Islamic cause should ever directly and intentionally target noncombatants. How, then, can one regard the judgment of Osama bin Laden as Islamic? The short answer is, one cannot. In subsequent discussions of his opinion, bin Laden does suggest that the United States is engaged in direct attacks on civilians, particularly in its ongoing air campaign in Iraq. This gives his own justification of indiscriminate war the aura of a kind of reprisal, in which the governing principle might be summarized as: The United States is attacking Muslim civilians. Now Muslims should attack U.S. civilians, in order to demonstrate resolve to U.S. policy makers, in hopes that they will alter policies that harm civilians in Iraq. But that is not how bin Laden puts it. Instead, he says that the ruling to kill Americans and their alliescivilians and militaryis an individual duty...in order to liberate the al-Aqsa Mosque [in Jerusalem] and the holy mosque [Mecca] from their grip, and in order for their armies to move out of all the lands of Islam, defeated and unable to threaten any Muslim. This is not the language of reprisal, but of constant and considered policy. In effect, bin Laden seems to say that indiscriminate war is and will be justified until the aims of war (removal of U.S. and allied forces, and indeed of any possibility of threat by such forces in the territories historically associated with Islam) are achieved. The quick response of Islamic authorities around the world to the attacks on the World Trade Center suggests that Muslims understand the problematic nature of bin Laden’s appeals to the law of Islam. Although many are concerned about the U.S. response and want to disassociate themselves from bin Laden in the interest of avoiding U.S. attacks, one ought not ignore the fact that bin Laden’s opinions exhibit a highly problematic interpretation of the Islamic law of war (to say the least). Extremely solid grounds exist, not simply in the just war theory, but also in Islamic tradition, for condemning the Sept. 11 attacks and for crafting a discriminate and proportionate response. This article also appeared in print, under the headline "Osama bin Laden and the Just Conduct of War," in the October 8, 2001 issue. John Kelsay John Kelsay, the Richard L. Rubenstein Professor in the department of religion at Florida State University, is the Tuohy Visiting Professor of Interreligious Studies at John Carroll University during fall 2001.